I've recently been having fun decorating these mini plastic buckets with washi tape. 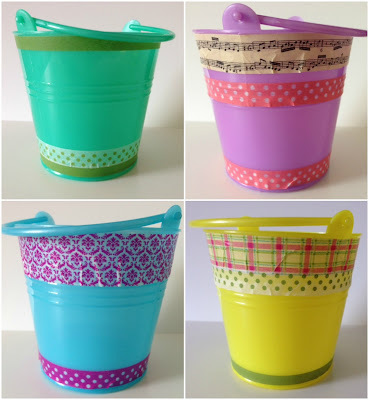 The plastic buckets were part of a craft bundle which I received as a member of the Baker Ross Bloggers Network. 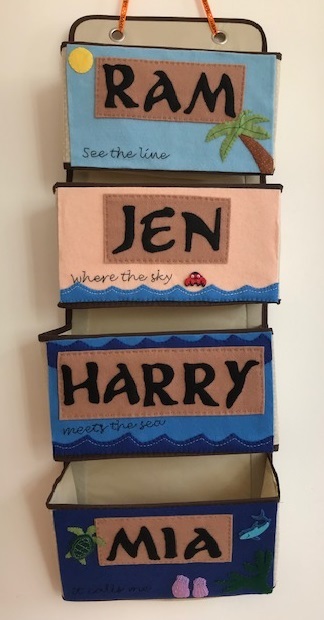 Two buckets were spirited away into the sandpit immediately by small people, but I hid the others, knowing that I could pretty them up into some useful and decorative storage. Armed with some washi tape I set to work. It's so ridiculously easy that I don't really need to explain how I did it! I love crafting with washi tape because it is so easy to reposition if you stick it in the wrong place and you can take several attempts at where you stick it. I did find that keeping the length of tape quite long was a useful technique. Because the buckets are curved I did end up with a few creases, but they smooth away pretty easily and aren't as obvious in real life. We have a new desk with shelves in our study which I am slowly marking out as my territory, and these little buckets are filling up the shelf nicely. They are useful for holding some of my crafty bits and pieces which I like to keep close to hand. Don't you just love washi tape, makes everything just a little bit cuter! Awww you have to LOVE Washi tapes, makes everything SO simple and yet so pretty! Thanks for joining in with the #GetYourCraftOn #Stationery challenge! !